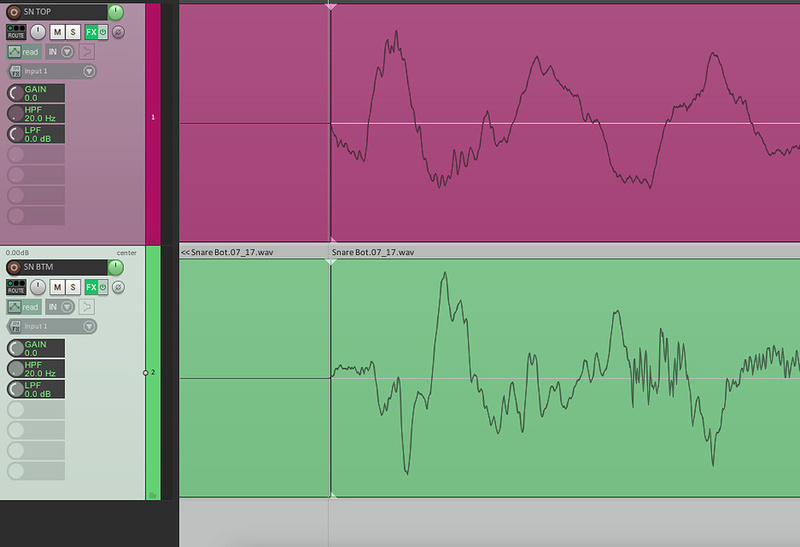 Here, we’ve zoomed in on two waveforms, the upper of which is from a snare top mic, the lower from an under-snare mic. As you can see the sound travels away from one mic while it travels towards the other — hence the need to ‘flip’ one channel, to make sure the waves are reinforcing rather than cancelling each other when summed. Why does everyone, pros and all, say that the snare bottom mic is ‘out of phase’, and that its polarity must be reversed? Isn’t it the top mic that should be reversed? The bottom mic is getting the signal from air pushed towards the mic, like it is when you mic from inside the bass drum, resulting in a positive initial attack. The top mic would logically show a reversed signal, as the air is pushed away from the mic on initial attack, resulting in reverse polarity. But there must be something I don’t grasp as everyone seems to tell me the opposite. SOS Technical Editor Hugh Robjohns replies: I think there’s confusion here because you are thinking about the snare drum in isolation, and with a presumption of establishing a positive-going wavefront from the monitor speakers, so that they ‘push’ the sound out of the speaker, leading with a compression wave (rather than a rarefaction). That’s all well and good as far as recording a lone snare drum goes, but it makes much less sense in the context of recording a full drum kit with additional mics. For example, a typical mic setup on a full kit will include overheads, and they’re going to pick up the sound radiating from the top batter head of the snare much more (and sooner) than the bottom head. Consequently, the leading edge of the pressure wave from a snare hit reaching the overhead mics will be a rarefaction because the drum skin is initially pushed away from the mics into the drum. This is also what the drummer’s ears hear, of course. Now, if you then supplement the sound captured by the overheads with a close snare-top mic, you’re going to need the close mic and the overheads to be working with the same electrical polarity as each other so that the low-end body sound from the snare doesn’t start to cancel out. If we assume all the mics are wired in the same polarity as each other (ie. the standard pin-2 hot arrangement), the close snare-top mic and the overheads will naturally all be in the same polarity as each other, so there is no requirement to invert the polarity of the snare-top mic. However, if you next add a snare-bottom mic as well, that one is going to get a compression wave when the snare is hit because the bottom skin will move outward towards the mic. As a result, it is definitely going to be in capturing a sound wavefront with the opposite polarity to both the snare top and overhead mics. Consequently, to avoid cancellation of low frequencies due to mixing signals with opposite polarities, the most obvious and easiest fix is simply to flip the polarity of the snare-bottom mic before it’s mixed with the overheads and snare-top mic. I hope that makes sense and clarifies the thinking of ‘pros and all’! Having said all that, it’s always best practice to check the polarity of each and every mic against the chosen reference (most people choose the overheads), and then check again with all the mics faded up — just because sometimes things just sound better with an unexpected configuration of polarities, depending on the distances between mics and the amount of spill they pick up.